Sweet Jumbles has been very busy on the marshmallow front, coming up with creations for everything from the Superbowl to the Oscars to Valentine’s Day. As a result, time spent baking has been limited. I kid you not, I have had a particular bread recipe hanging on my fridge for 2 weeks now just waiting for me to bake it! Maybe this weekend…. In the meantime, I realized it had been some time since my last post, so I wanted to touch base with all of my dedicated readers. 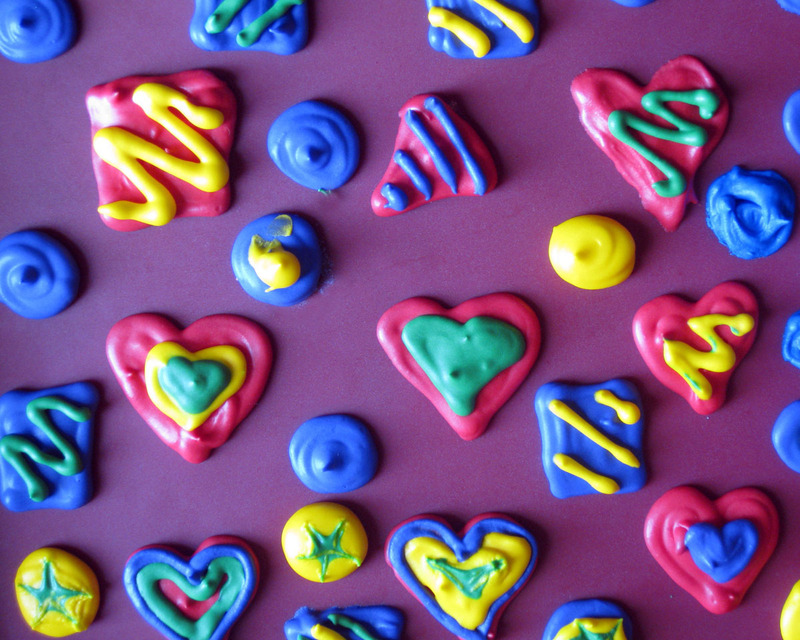 This post is less of a recipe and more of a secret tip with regard to Royal Icing. If you aren’t familiar with Royal Icing, it’s that really beautiful icing that hardens on cookies. 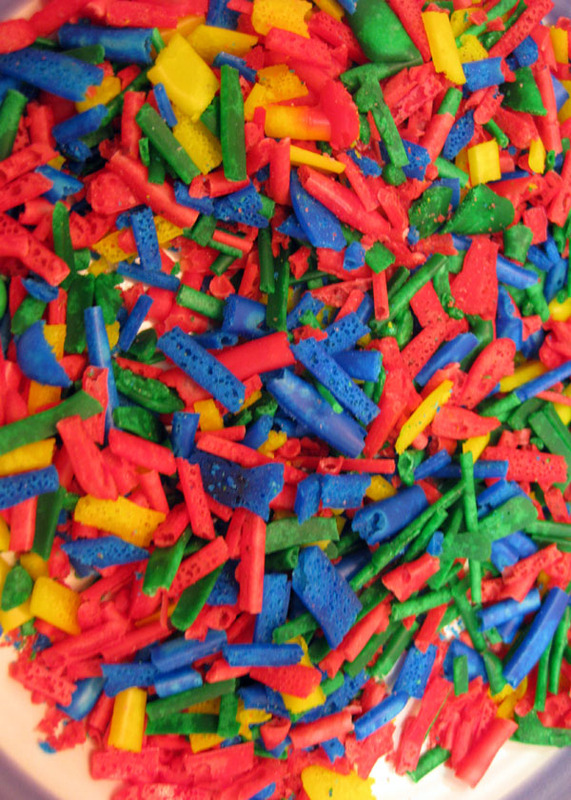 Bakers use it to do very intricate pieces of what can only be described as art. But, even the novice can make some pretty good looking treats. In the past, I’ve included them on this blog when I made baby shower themed cookies and fireworks cookies for the Fourth of July. Other people go more bananas, such as this Honeycomb Sugar Cookie, which by all accounts is beautiful but 6 cookies for $108 seems a little bit WHO THE HECK ARE YOU SELLING TO?! crazy. So, let’s imagine you decorated some normal (not $108) cookies just for the fun of it and you have leftovers. I’m here to help. You can go back to the Fireworks blog post for the Royal Icing recipe, but the truth is any royal icing recipe is about the same and it’s easy as 1-2-3. The trick is learning how thick to make the icing and that is all a matter of getting your hands sticky and figuring it out. Now, as for that leftover icing…. Maybe you always know exactly how much to make and you don’t have leftovers. If so, good for you but I inevitably have leftovers. Sometimes a lot. Until recently, I threw that stuff away…but not anymore! There are (at least) two really cool things you can do with those leftovers. For both, you need to get out a big ol’ cookie sheet and line it with waxed paper/parchment paper/slipat. Ready? 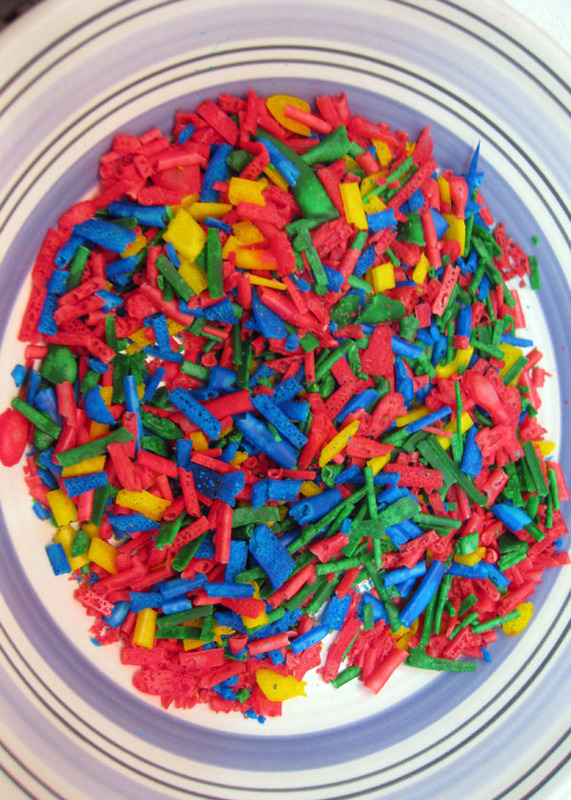 Item #2 is jimmies (or, depending on where you are from in the country, “sprinkles”). You know, the little sugary things you throw on top of an ice cream sundae (or cupcake, or cookie…). To make these, pipe long, thin lines of royal icing on your prepared surface side by side, in relatively straight lines. Wait 24 hours. I’m not kidding. Don’t wait 12, you’ll regret it. Then, chop them into little segments just like the jimmies you are used to buying at the store…or longer, or shorter, whatever you want. Again, store until the apocalypse. Now your royal icing leftovers aren’t wasted and you have sundae toppings and cupcake toppings to impress your friends! Yum yum! This entry was posted in Baking Jumbles, Candy Jumbles, Slutty Jumbles and tagged cupcake toppers, jimmies, marshmallows, royal icing, sprinkles, sweet jumbles. Bookmark the permalink.